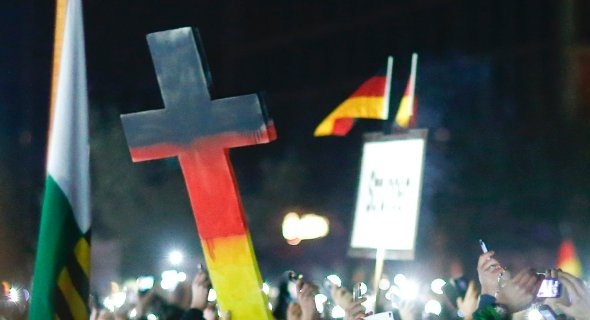 -What are the Right Christians in Germany? Dirsch: In general, this is a rare kind of people. These are people who are mainly involved in Protestant-Gospel activities, for example, in the circle of the magazine "Idea". Or to the right Catholic organizations, for example, at the Institute for Social Policy in Bonn. For some time, there has also been a group called “Christians in Afghanistan”, which includes conservatives of both denominations. Many Christians with Right views are represented in the AfD political party. Thus, it turns out that right-wing Christians are those that are marginalized in institutional churches. Some of them sometimes encounter problems in their local churches. It should be emphasized, however, that in the true theological sense of the division into Right and Left Christianity is incorrect. Any Christianity is centered on Christ the Lord. But, of course, there are various interpretations of right-wing and left-wing Christianity. They come from the most ancient times of the church, but they began to manifest themselves in the context of modernity. - Are the Christians mostly Catholics or Protestants? Dirsch: As I mentioned above, in both denominations there are Christians who can be called “Right”. For clarity, I consider it important to define the term "Right." As a result of state propaganda, we always mean the demagogic equation of the “Right”, “Right extremists” or even the “neo-fascists”. However, Christian dogma says: "He sits at the right hand of the Almighty Father." "Right Christians" are also those who prefer certain politically right-wing critical views. Among these views, the criticism of uncontrolled mass immigration. A true Christian sees the uncontrolled “opening of the border” not as a manifestation of Christian humanism, but otherwise. If only because it is detrimental to the common good. -Lefts like to claim that Christ was already a socialist. Right? Dirsch: If someone understands this as a voluntary renunciation of property in the name of the Kingdom of Heaven, then this statement makes sense. In general, however, the socialists basically understood themselves as a purely secular group. The idea of a better society was mostly purely secular. -Why is the official church in Germany positioning itself as Leftist? Dirsch: Of course, it's always more convenient to sail with the current. Another reason, of course, is institutionalization as a public corporation. I support this legal position of the churches in principle. But, of course, it also brings flaws. The content of my theologians and church leaders, the doctrine of left and secular humanity, in which all human beings are equal in the sense of human dignity, is identical to the charity of Christians. I myself would like to follow the commandment 1 of the Basic Law. However, it is first important to determine this content. A few years ago, the Federal Constitutional Court ruled on the asylum seekers claim, citing the concept of human dignity. Lawyers rightly regarded this precedent as an entry ticket to the welfare state. For a long time, the tendency to inflate and thus devalue the rights to guarantee human dignity has been observed throughout the EU legislation and journalistic disputes. From the point of view of the Catholic doctrine, it can be said that such great teachings of the Church as the Word of St. Augustine and St. Thomas justified the need for a deliberate and balanced attitude to the duty to love your neighbor. It should be emphasized here that the New Testament knows a number of fundamental universalistic statements, such as a baptismal command or a duty to help in the parable of the Good Samaritan. But these postulates are addressed to individual Christians and are personalized services. They do not concern real politics. The main tasks of the state include the protection of borders. Christian's duty to charity is indisputable. But the key question is: where is this help most effective? Here the Catholic social doctrine requires an analysis of reality. Specifically in relation to our example, this means that in the German social security offices, the efficiency of financial resources is lower than in those places where more assistance would have to be provided directly. There, under certain circumstances, investment can cause ten times more good than a certain amount of money. - One of the main tasks of the churches is pastoral care. Does it suffer from the increasing politicization of the Church? Dirsch: In general, that's what happens. There is a strong globalization, loss of church connections, and also a crisis of traditional faith. These are just a few key points. However, it is doubtful whether these negative events can be compensated for by a growing humanistic commitment that ignores particular faith. This trend is probably related to the fact that church officials also suffer from a fundamental loss of faith. The Protestant Church increasingly understands itself as the "civil religion of political correctness." This moralistic trait can be traced back to Martin Luther. Unfortunately, the Catholic Church also follows this basic direction. Unfortunately, there is often no difference in political practice. Funny Catholic political activity is not allowed here and there. - The Christian church, which still seems completely immune to left-sided influences, is Orthodox. Is this "Right Christians"? Dirsch: I think this term does not quite fit. Unfortunately, I do not know enough of the Orthodox tradition. The use of Orthodoxy is very different depending on the region. In countries such as Russia, after the events of the 1990s, there was a revival of the proximity of the church and the state. This can lead to problems. The Russian Church is often discussed in the context of such issues as homosexuality, abortion, and arrest. But, unfortunately, I can not say more about this. But this, of course, such a struggle is a good sign. I am always glad to see that a large part of Armenian Christianity is even more conscious, religious and connected with the church than can be imagined in this country. -The president of The German Protestant Church Assembly, Hans Leiendecker, considers it necessary to exclude AfG. Are you afraid of public confrontation with the largest opposition party in Germany? Dirsch: Of course, the leadership of both churches is afraid of a dispute. There is not enough courage. Of course, AfD is not a Christian party, but a group that primarily wants to represent the interests of Germany. After all, AfD pursues goals that have common points with classical Christian requirements. -What do you think: will the great official churches in the long run become politicized again, or will more and more Christians instead seek and find an alternative? Dirsch: I assume that the current trend will dominate in order to compensate for the losses resulting from secularization through left-wing socialist and left-wing liberal societies and participation in the common “struggle against the right”. The fact that this will stop the downward spiral is hardly possible. However, no one here has reliable remedies. I hope that in certain circles the correct faith and the true testimony of the Lord will still be visible. But such actions affect small circles rather than unmanaged majority.